I came up with travel mechanics using ICRPG. These are tentative, and suggestions and ideas are more than welcome. Target: 12 default, and made Easy or Hard by weather, awkward terrain, or getting off-track. Hearts: each heart represents an abstract distance to your destination, so 2 hearts is a very distant destination or place of safety. Effort: d4 basic effort to reach safety, and the sooner you get to your destination, the better. Turns: in days, and the GM’s turn is about what happens when you are camping, weather and terrain description for flavor, and any goodies (Treat) you may have happened across on that day’s travel. Also on the GM’s turn, you use 1 ration and possibly an active Threat to roll against, like maybe a pursuit or an ambush while you are camping, which would lead to an encounter in Moments. Timer: Every d4 rounds/days, something bad happens, like an injury or monster encounter or fever or sudden natural disaster or dangerous obstacle. When you reach the Heart (10) with your d4 rolls, you have reached your destination. I am coming up with modifications for hex-crawling and stopping to explore single “hexes,” or areas of land, but this is the start. What do you think? Does it fit the flow of the rest of the game? I didn’t really want a mini-game with too many specialized rules. Hearts representing distances to safety or a “dungeon” is undoubtedly pretty abstract, but at any rate, to me that seems to fit the overall impressionism I feel when using ICRPG rules. A little Overworld crawl is fun I think. Mostly for describing the different climates/terrains and flavorful random encounters. 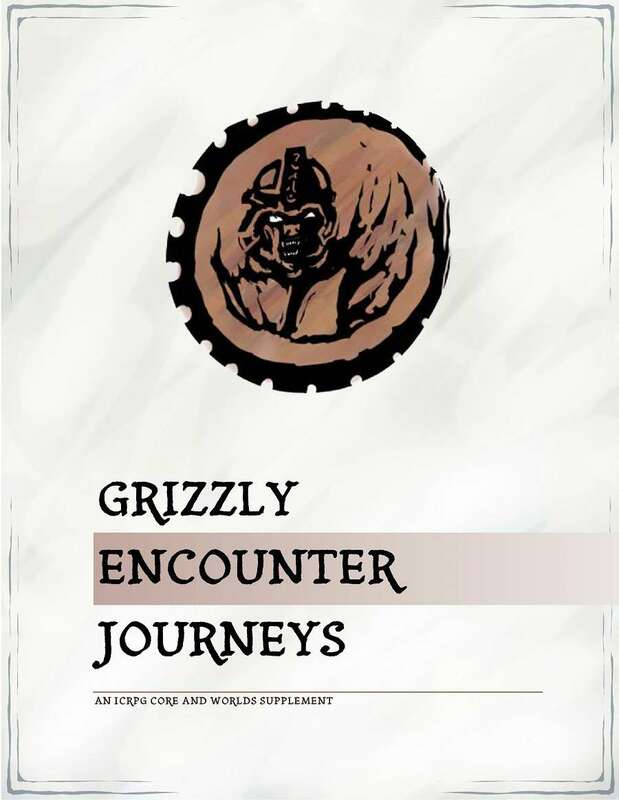 Check out Journeys by our very own GM Grizzly! That is my go to for Travel mechanics. the d4 progress means larger parties move more quickly and with less risk monsters and mishaps. This is, to me, less interesting than the opposite, since larger parties are also more well equipped to deal with misfortunes of all kinds. For this reason, I’m more in favor of TOR style travel, where mishaps are triggered by bad dice rolls meaning that a large party will trigger them often but handle them well, but that it is disastrous for the lone wanderer whenever once in a blue moon s/he suffers them. the progress system also means that a quick party will be safer. This is fine, but to me it is more interesting if you get a choice between speed and safety.